Periodontal tissue is susceptible to chronic periodontal disease, which results in irreversible tissue destruction. Adult stem cells can be obtained from the periodontal ligament of the periodontium. Stem cells from the periodontal ligament (PDLSCs) are promising for periodontal regeneration because they can undergo guided differentiation under specialized conditions. Currently, growth factors and scaffolds are used for differentiation and clinical application of PDLSCs. In this review, characteristics of PDLSCs and related factors are selectively analyzed. One of the most important facets of stem cell research is clinical application. Among the stem cells currently being researched, adult stem cells are much more likely to be used in clinical applications. Dental stem cells including periodontal ligament stem cells (PDLSCs) are adult stem cells that have the potential to impact regenerative medicine. Many experimental trials and clinical applications have attempted to treat incurable or destructive diseases. Stem cells have the capacity to self-renew, form colonies, and differentiate into a variety of cells . Depending on the signals in the stem cell niche, stem cells can either maintain self-renewal conditions or differentiate into specific cell lineages . Currently, isolation of several types of stem cells has been reported in human studies. Stem cells can be grouped into three main categories: embryonic stem cells (ESCs) , induced pluripotent stem cells (iPSCs) , and mesenchymal stem cells (MSCs) . MSCs, as multipotent progenitor cells, can be isolated from adult bone marrow or other adult or prenatal tissues. Adult stem cells usually differentiate into cells of the tissue in which they reside. However, their ability to differentiate into completely different cell types, regardless of origin, has been demonstrated in many studies . Dental tissue-derived stem cells are a kind of mesenchymal stem cell that has the ability to undergo cell division and self-renewal and has multipotent capability. There are five subtypes of stems cells originating from dental tissue in different parts of the tooth and supporting structures. These include stem cells from human exfoliated deciduous teeth (SHEDs) , stem cells from apical papilla (SCAPs) , dental pulp stem cells (DPSCs) , periodontal ligament stem cells (PDLSCs) [10••], and dental follicle precursor cells (DFPCs) . PDLSCs have been isolated and tested for their ability to develop into various types of tissues in in vitro and in vivo experiments. PDLSCs display multipotent differentiation capacities including differentiation into osteogenic, neural, and adipogenic cell lines [10••]. Due to this multipotent differentiation ability, PDLSCs can be used in regenerative medicine because they provide a source of cells not only for dental tissue regeneration but also for repair of non-dental structures such as bone and nerves [12, 13]. The periodontal ligament is a fibrous connective tissue that fixes a tooth to the surrounding alveolar bone. This structure has been reported as an adult stem cell source that is capable of regenerating alveolar bone tissue and maintaining homeostasis of the periodontium. Human periodontal ligament stem cells (hPDLSCs) located in the periodontal ligament from extracted third molar teeth have self-renewal capacity and the potential to differentiate into various specialized cells . In previous studies, hPDLSCs have been shown to possess the properties of MSCs; differentiating into osteoblasts, chondrocytes, adipocytes, and other lineage such as neurons [15, 16, 17, 18]. The multipotent characteristics of hPDLSCs are critical for their use in clinical studies and stem cell therapy in dentistry. Isolated hPDLSCs show fibroblastic and spiky morphology and express STRO-1 and CD146/MUC18, which are markers of mesenchymal stem cells [10••]. In addition, hPDLSCs transplanted with hydroxyapatite and tricalcium phosphate (HA-TCP) into immune-compromised mice generate cementum/PDL-like tissues resembling Sharpey’s fibers that join the cementum and alveolar bone [10••, 19]. Transplanted PDLSCs and DPSCs in swine restore functional tooth-like structures by providing a source of cells for dental tissue regeneration . Moreover, hPDLSCs have similarities to cells from tendons and ligaments, expressing scleraxis, a marker of tendons and ligaments , in order to support heavy occlusal force during mastication of food, bruxism, and clenching [10••]. hPDLSCs suppress osteogenesis to maintain the space between the cementum and surrounding alveolar bone through expression of S100A4 and Twist genes [22, 23]. Even though PDLSCs are considered adult stem cells, induced pluripotent stem cells (iPSCs) from PDLSCs, which are similar to embryonic stem cells (hESCs), are more potent than PDLSCs. iPSCs from hPDLSCs have been confirmed using specific pluripotent gene markers and identification of telomerase formation [24, 25]. More potent iPSCs from PDLSCs make it possible for the cells to differentiate into a wider variety of cell types than other somatic stem cells. In addition to the regeneration capacity of dental tissues of hPDLSCs, another characteristic of these cells is their ability to modulate immune reaction in clinical applications. During periodontitis, the amount of bone supporting the teeth and surrounding structures is destroyed by strong resorptive bone remodeling in which immune responses to inflammation trigger osteoclastogenesis [26, 27, 28]. As a part of the periodontal ligament, PDLSCs are a potential stem cell source for reconstruction of the periodontal ligament . A previous study has demonstrated that allogeneic PDLSCs impede immune responses against activated T cells in vitro and trigger reconstruction of the periodontal ligament in vivo by blocking T cell activation [28, 30]. Also, PDLSCs suppress the proliferation, differentiation, and immune reaction of B cells through secretion of interlukin-6 (IL-6) and interaction between programmed cell death protein 1 (PD-1) and ligand (PD-L1) [28, 31]. In this context, hPDLSCs might be useful as an allogenic source for regeneration of dental tissue because of less severe immune effects, including lack of rejection to allogenic hPDLSCs, easy isolation, potent differentiation capacity, and immunosuppressive effects. PDLSCs have a fibroblastic morphology and express markers similar to those of MSCs [32, 33]. MSCs express at least 95 % of CD73, CD90, and CD105 surface antigens and less than 2 % of hematopoietic antigens and endothelial cell lineage markers . Phenotypically, PDLSCs positively express a variety of stromal cell markers, including CD13, CD29 (integrin β1), CD44, CD73 (ecto-5′-nucleotidase), CD90 (Thy-1), CD105 (endoglin), CD106 (vascular cell adhesion molecule; VCAM-1), and CD166 [10••, 28, 35, 36, 37]. PDLSCs are negative for the following markers: CD11b, CD14 (monocyte and macrophage markers), CD31 (endothelial marker), CD33, CD34 (primitive hematopoietic progenitor and endothelial cell markers), CD45 (pan-leukocyte marker), CD133, CD144, and B cell markers such as CD79, CD19, and HLA-DR [10••, 28, 35, 36, 37]. It has also been shown that PDLSCs include about 3 % STRO-1- and CD146-positive cells (>3 % [10••, 35] or >80 % ) [33, 38]. However, specific markers for identification of PDLSCs have not yet been characterized. Recent studies have demonstrated that PDLSCs express pluripotent stem cell markers including OCT3/4, SSEA4, and SOX2 [35, 39] and the tendon-specific marker, scleraxis [10••, 40]. Functionally, PDLSCs are capable of self-renewal and differentiation into multiple cell lineages under proper stimuli [10••, 37, 41]. During osteogenic differentiation, PDLSCs express osteogenic markers including alkaline phosphatase (ALP), bone sialoprotein (BSP), runt-related transcription factor 2 (RUNX 2), matrix extracellular phosphoglycoprotein (MEPE), and osteocalcin. In addition, calcium deposits have been observed using alizarin red S staining [10••, 36, 37, 41, 42]. Furthermore, the expression of cementum-specific protein (CP23) and collagen type XII, putative cementoblast markers, have been detected in PDLSC transplants . During adipogenic differentiation, PDLSCs express adipogenic markers such as peroxisome proliferator-activated receptor gamma2 (PPAR γ2) and lipoprotein lipase (LPL). In addition, accumulation of lipid vacuoles can be assessed using Oil Red O staining [10••, 37, 41, 42]. During chondrogenic differentiation, PDLSCs express cartilage-specific molecules such as collagen type II, SOX9, and aggrecan. Expression of glycosaminoglycans can be confirmed by Safranin-O staining or toluidine blue staining [41, 42]. A growth factor is a protein or steroid hormone that can stimulate cellular growth, proliferation, and differentiation. Growth factors bind to cell surface receptors on their target cells and act as effector molecules to modulate target cells. To date, many growth factors have been investigated and found to have promising effects on periodontal regeneration [43, 44, 45]. Stimulation or enhancement of PDLSCs can induce fibroblast proliferation, osteogenesis, and adipogenesis. Efficacy and efficiency are still an issue in the effective application of growth factors to periodontal regeneration. The following is a summary and recent update on growth factors that influence cellular processes of periodontal stem cells or progenitor cells (Table 1). Fibroblasts are the principal cells residing in the PDL, which is comprised mainly of collagen type I, and serves to connect the tooth roots to alveolar bone. A recent study revealed the efficacy of TGF-β1 on the induction of PDLSC differentiation towards a fibroblastic phenotype, as well as inducing intense expression of TGF-β1 in whole PDL tissue [45, 44]. However, addition of TGF-β1 negatively affects osteogenic differentiation. Recently, Ochiari et al. reported that the presence of TGF-β1 inhibits osteoblast differentiation via IGF-1 suppression and down-regulation of the PI3K/Akt pathway . These findings suggest that TGF-β1 regulates periodontal tissue regeneration by efficiently controlling fibroblasts and osteoblasts under harsh environmental conditions. In contrast to down-regulation of the osteoblast-like features of PDLSCs by TGF-β1, PDLSCs show an increased capacity for tendon regeneration by TGF-β3 . Choi et al. also reported that TGF-β3 and/or BMP 6 can singly or synergistically enhance chondrogenic differentiation in vitro . Bone morphogenetic proteins (BMPs) are functional growth factors that belong to the TGF-β superfamily . Originally identified by their ability to induce bone and cartilage regeneration, BMPs are currently considered a group of essential morphogenetic signals that contribute to the formation of tissue structures throughout the body . The important role of BMPs has been revealed by mutations in BMPs and BMP receptors in several diseases. Overexpression of BMP-2/4, BMP-5, and BMPR-IA is related to malignancy of the oral epithelium . BMP4 induces EMT and invasion of various types of cancer cells in ovarian, oral, and pancreatic cancers [52, 53, 54]. Among the 20 BMPs, BMP-2 and BMP-7 are known to induce new bone and cartilage formation and play a key role in osteoblast differentiation. Recently, recombinant human BMP-2 using adenovirus (rhBMP-2) was produced and applied to periodontal regeneration. Collagen hydrogel (1 %, 200 μl) mixed with HA has been used for rhBMP-2 delivery. Ligature wire was shown to induce peri-implantitis in six adult beagles that were sacrificed 3 months after transplantation. The results showed that ex vivo BMP-2 gene delivery to PDLSCs enhances new bone formation/re-osseointegration in peri-implantitis defects . In vivo transplantation of HA/TCP on the dorsal surface of 14 immunocompromised mice with hPDLSCs/rAd-BMP-2 also effectively promoted bone formation . Interestingly, adenovirus-derived rhBMP9/PDLSCs have been shown to induce osteogenic differentiation via the MAPK pathway through inhibition of p38 and ERK1/2 . Basic fibroblast growth factor or FGF-2 is a growth factor present in the basement membrane and plays a role in wound healing, tumor development, and angiogenesis. The role of FGF-2 in osteogenesis is still disputable because it inhibits bone regeneration at continuous or high concentrations, whereas endogenous FGF-2 is essential for osteogenesis [58, 59]. Recent studies have revealed that FGF-2 might be a powerful promoter of progenitor cells in hard tissue regeneration, but exogenous FGF-2 can inhibit terminal differentiation . The results of Hidaka, that FGF-2 enhances the proliferation of PDLSCs while retaining adipogenic/osteogenic differentiation potential, support this conclusion . With respect to Notch signaling during PDLSC differentiation, mineralization is augmented by Notch but attenuated by FGF-2 . Pretreatment with recombinant human FGF-2 during culture enhances the stem cell population and osteogenic potential [43, 63]. Enamel matrix proteins serve as precursors to acellular cementum during cementogenesis . The presence of acellular cementum acts to signal the development of PDL fibers, followed by alveolar bone formation, which results in the formation of periodontal tissue . Enamel matrix derivatives (EMDs) can be isolated from porcine tooth buds because of the high level of homology between pigs and human enamel proteins . A commercially available purified form of enamel matrix proteins, enamel matrix derivative (EMD; Emdogain®), is composed mainly of amelogenin and promotes PDL fibroblast proliferation and inhibits epithelial cell proliferation . EMD also stimulates osteoblasts and inhibits osteoclast formation, both of which are important for increasing alveolar bone growth . EMD contains BMP-2 or BMP-7 in addition to amelogenin protein. The effect of EMD on human PDL progenitor cell proliferation/migration is mediated through amelogenin . Interestingly, Kato et al. showed that a synthetic oligopeptide from EMD significantly increases the proliferation of PDLSCs, as well as mineralization . Platelet-rich plasma (PRP) is enriched blood plasma with platelets. These concentrated autologous platelets contain and release several growth factors and other cytokines through degranulation, including platelet-derived growth factor, transforming growth factor beta, fibroblast growth factor, insulin-like growth factors 1 and 2, and vascular endothelial growth factor [71, 72]. PRP is a good source of growth factors that enhance periodontal regeneration against physiologic and pathologic conditions. However, there is controversy over the exact concentration of PRP needed for applications. Two recent studies reported that 1 % PRP enhances proliferation and differentiation of PDLSCs [73, 74]. One report showed that RANTES/CCL5 and ICAM-1 play important roles in this process . Another report showed that 1 % PRP stimulation increases extracellular matrix production and positively affects cell behavior in PDLSC sheets in vivo . Scaffolds play a key role in regeneration of periodontal tissue by holding cells and various bioactive materials; therefore, numerous attempts have been performed to find an optimal scaffold (Table 2). The important properties for a scaffold are the ability to recruit or hold cells and bioactive materials until successful regeneration and biocompatibility and biodegradability. Scaffolds can be classified by form and materials. The form of a scaffold is influenced by the defect site and characteristics of tissues to be regenerated; films, sheets, sponges, particles, colloids, and gel types are currently used. Furthermore, various materials have been used to develop scaffolds including collagen sponges [38, 75], gelatin sponges [38, 76], bone materials [77, 78], alginate hydrogels [79, 80], biodegradable polyesters [81, 82, 83, 84], polydopamine , silk fibroin , graphene oxide, mesoporous bioactive glass , and amnion . Surface treatment of a scaffold has been tested to improve biocompatibility through hydrophilic changes  or to improve stability and bone forming ability using hydroxyapatite granules [89, 90]. Advancements in technology have contributed to the development of scaffolds. For example, micro- or nano-scale fibers can be obtained from liquid through electrospinning. Recently, 3D printing technology has been used to develop 3D scaffolds. In periodontal tissue regeneration, complex components like cementum, periodontal fibers, and bone compartments should possess functional structures; therefore, 3D scaffold is promising. Cell sheet technology, also known as a nanotechnology-based temperature responsive culture surface system, can be combined with 3D scaffolds. This technique has been successfully applied to animal models for periodontal regeneration [91••]. 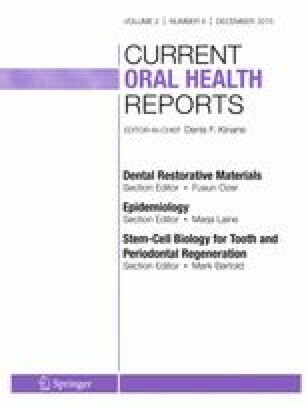 PDLSCs have been identified and characterized for decades as adult stem cells from the periodontal ligament. These cells can be selectively expanded under ex vivo conditions and can be differentiated into several types of mature cells for regenerative purposes. During differentiation, many types of growth factors and scaffolds can be useful to overcome current limitations of the tissue repair process. PDLSCs have the potential to be clinically applicable for future periodontal regeneration. This article does follow ethical guidelines for human and animal right, and experiments performed by authors obtained IRB approval in advance. Zhu W, Liang M. Periodontal ligament stem cells: current status, concerns, and future prospects. Stem Cells Int 2015. doi: 10.1155/2015/972313. Xu Q, Li B, Yuan L, et al. Combination of platelet-rich plasma within periodontal ligament stem cell sheets enhances cell differentiation and matrix production. J Tissue Eng Regen Med 2014. doi: 10.1002/term.1953.